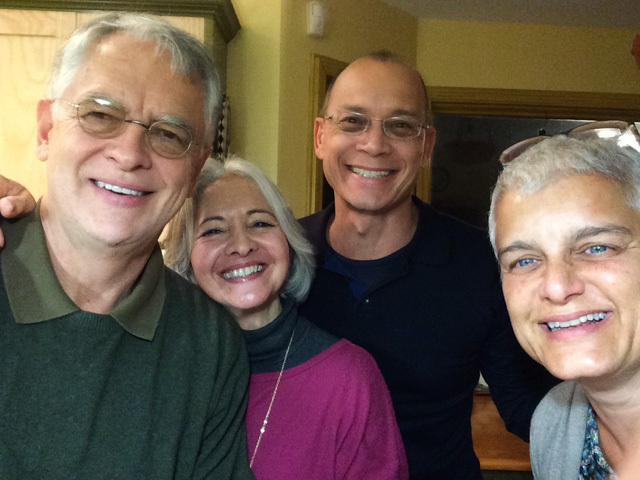 IN MY KITCHEN: HAPPY NEW YEAR! First of all, I’d like to wish all my readers a wonderful New Year! To start things off on a great note, I join the virtual party started by Celia and now hosted by Maureen from The Orgasmic Chef, sharing a little bit of what goes on around one of the most important spots in any home: the kitchen! I have quite a few gifts to share with you, starting with a wonderful surprise I got in the mail shipped all the way from Australia. Celia, the angel behind In My Kitchen sent me this gorgeous letter opener. It sits right by our cork wine screw board, because I always open my mail right there in the kitchen. I love it! Not only because I am fond of all things shiny, but because Celia made it herself. THAT makes it ultra super special. Thank you, Celia! 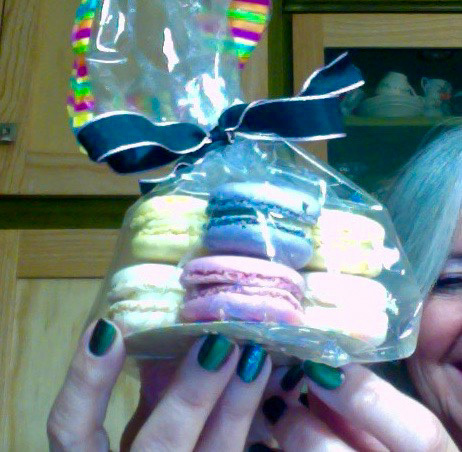 From a friend from KSU, a batch of home-made macarons, wrapped in a beautiful package and delivered right to our door! Can you spell lucky? Lucky Sally? Yeap. That just about sums it. They were beyond delicious, my favorite was the pink one filled with strawberry jam. Jam made from scratch, in case you are wondering. From my stepson and his wife, C & C also known in the blog as “the coolest couple in LA”, a custom-made apron. Not just any apron, mind you. This is a Hedley & Bennett apron. Oh, my….. I can only hope I can make it justice. One thing is certain, I am not baking any cakes wearing it. 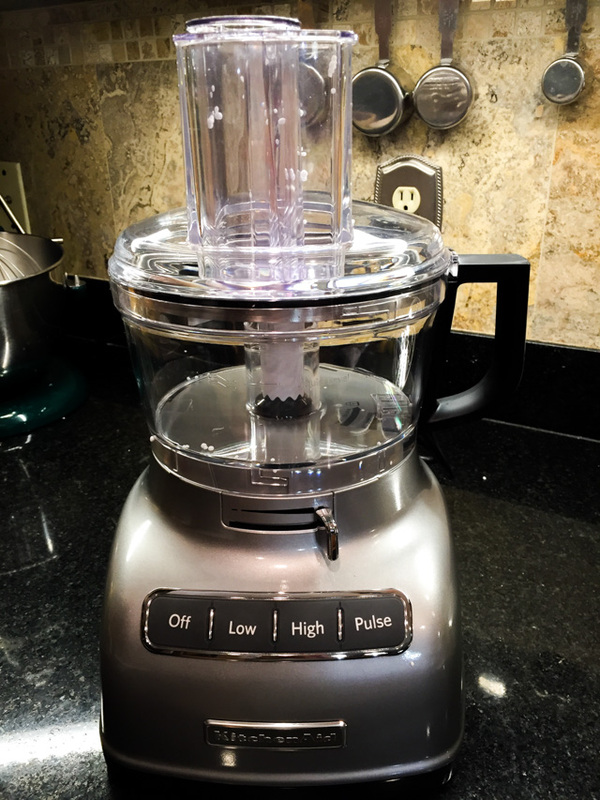 From my dear hubby, a new food processor was my Christmas gift! My Cuisinart was 18 years old and started acting his age, almost failing on me as I was making hummus for one of our recent receptions. I love this 7-cup model from KitchenAid, very smooth to operate, the plastic bowl is quite sturdy. Made perfectly sliced potatoes for a gratin in seconds, allowing the mandoline to stay in the cabinet and my fingers stay unharmed. 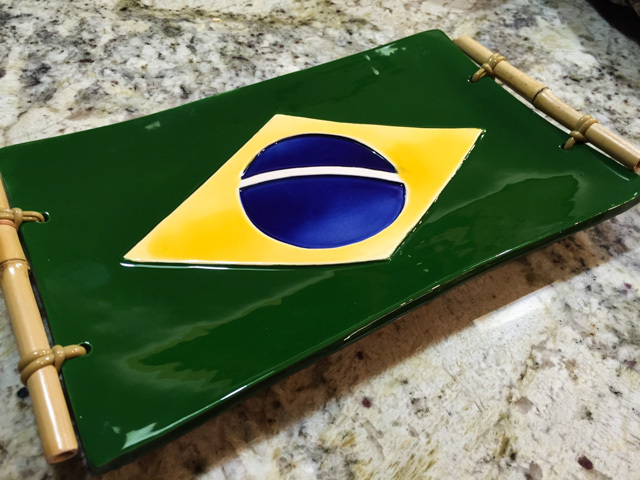 Finally, from our dear friends from Brazil, Vanda and Claudio, a wonderful platter they brought with them all the way from São Paulo (as you read this we are having fun in the ski slopes of Silverthorne, hopefully with all the bones in correct alignment). 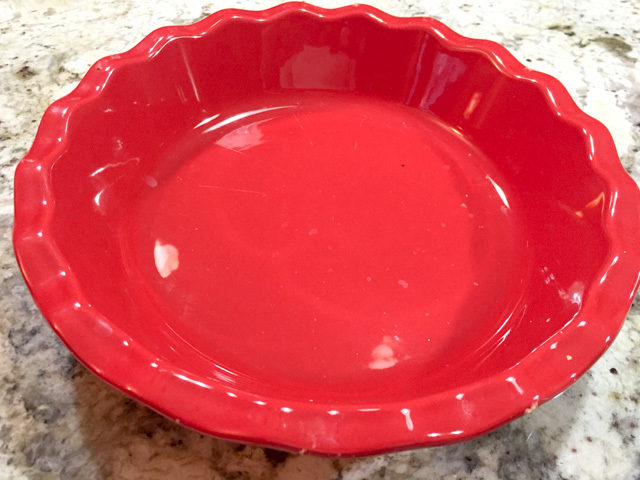 A new, shockingly red pie plate that was on sale at Bed Bath and Beyond last month. 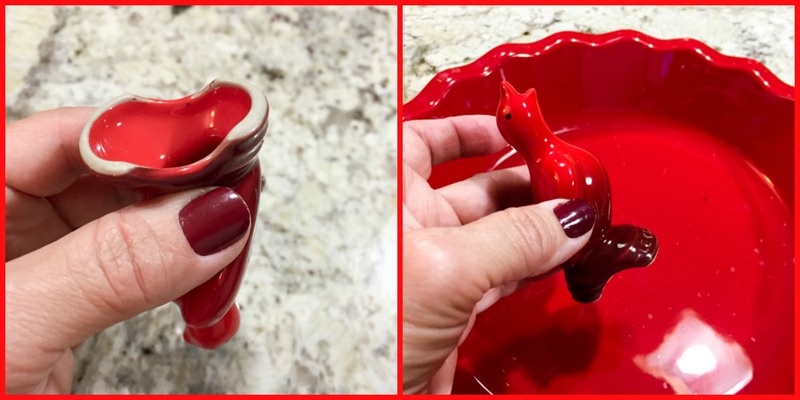 I have a hard time resisting things that are bright red, as you know by now…. Have you ever heard of a pie bird???? I had not until I saw this apple pie recipe from Alton Brown. I had to have one. The pie bird works by allowing steam to escape from the inside of the pie as it bakes. Plus, it looks simply adorable. Here you can see its shape better. After getting it, I found out you it can also be used in savory pies. Any pie that calls for slits cut on top can be instead made with the little bird in the center. Since we are on the subject of pies, I finally upgraded from a bag of beans (which I’ve used for 6 years straight) to real pie weights. Also found on sale at Bed Bath and Beyond. Haven’t tried them yet, but intend to do so in the near future. This is actually several months old, but for one reason or another I forgot to include in previous IMK posts. 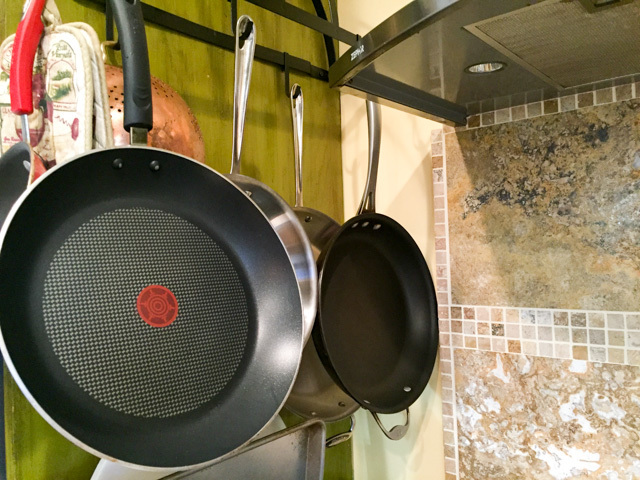 When I started watching America’s Test Kitchen on TV, I could not help but notice they use this pan all the time. It is their number one recommended non-stick pan and I must say it is awesome! 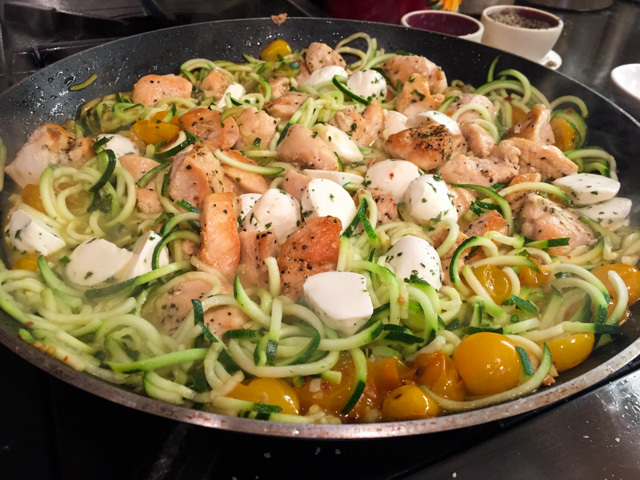 I don’t have enough adjectives for it, See it in action working on a batch of zucchini noodles…. This particular recipe won’t be in the blog until I tweak it a little, though. 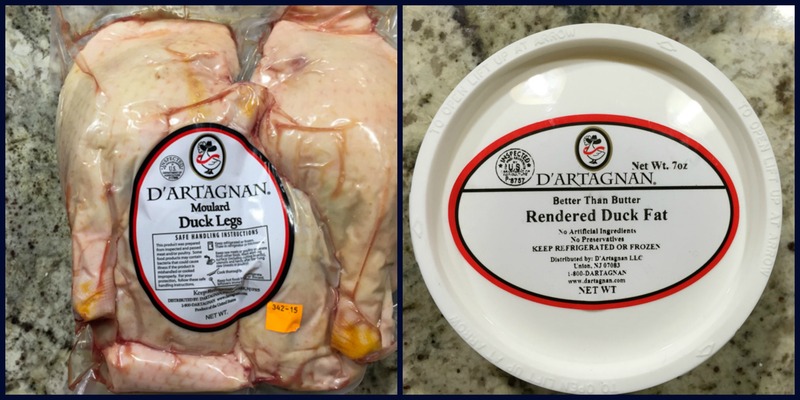 Duck legs and rendered duck fat from d’Artagnan… for a duck confit made for Phil’s Birthday dinner… on the blog sometime in the near future, I promise! It was quite likely one of the best meals I cooked in 2015. A very odd-looking egg… no idea what happened with this egg, in fact if anyone has an explanation for its wavy shell, please let me know in the comments. I ended up discarding it, as when I broke it the egg yolk did not look quite right. Better safe than sorry. 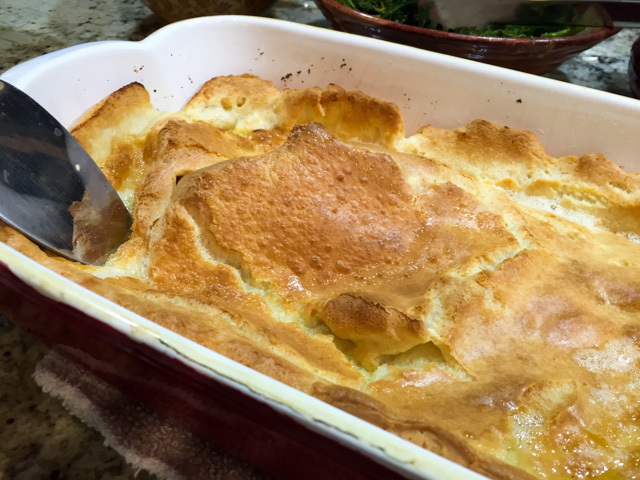 A batch of Yorkshire pudding that was our side-dish at Christmas Eve… made by my dear husband, who also prepared a Mexican-Style Prime Rib Roast (already on the blog, click here for recipe). A new cookbook! How could I resist it, when it was written by John Amici, the man behind a blog I’ve been following for a long, long time? 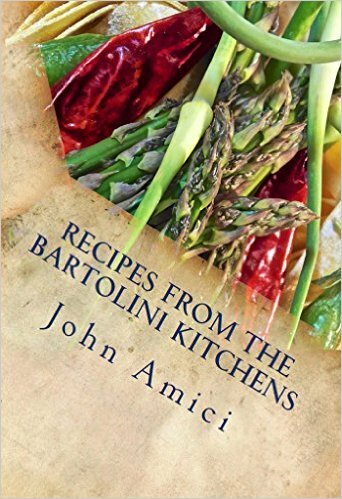 The book is just like John, classy and warm, and showcases authentic family recipes he’s been collecting over the years. You need it. Did you know that? To order, click here. 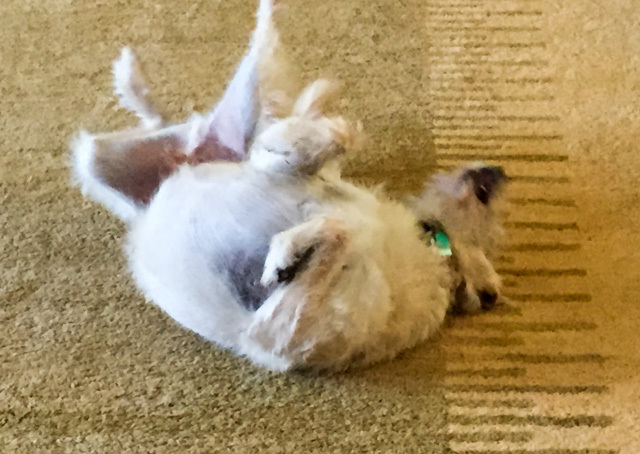 But, as usual, our pups are anxious to say hello…. Whereas Oscar shows a slightly different concept of style and elegance…. And he definitely does not learn from his mistakes. Here he is covered in burrs, once again having to go through the complicated process of combing them off. Quite a bit of whining and complaining, as if Daddy was skinning him alive (eye roll to the ceiling). But, of course, we all know how vocal Oscar can be…. That’s all for now, folks! More to come as the New Year moves along! FOUR YEARS AGO: Maui New Year! I totally love these posts! Apron = cute. New food processor = jealous. 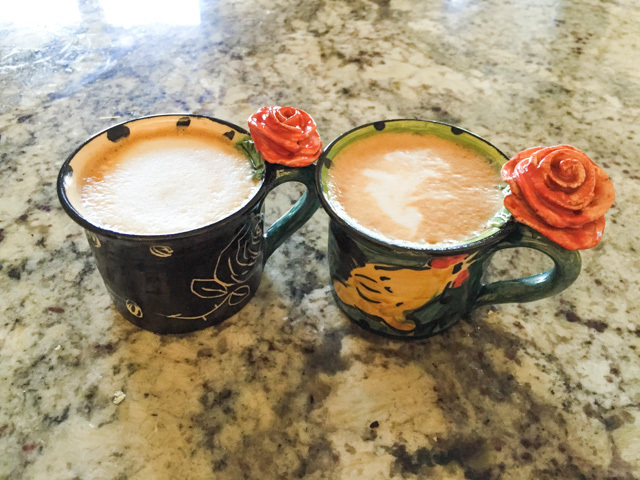 Coffee cups = adorbs. Pie bird = I bought one when I read Alton Brown’s apple pie recipe but have never had the nerve to actually make it! Even bought the pan. Maybe 2016 will be my year! Duck legs and fat = where did you get that?? Need!! Egg = weird. I’d have tossed it too. 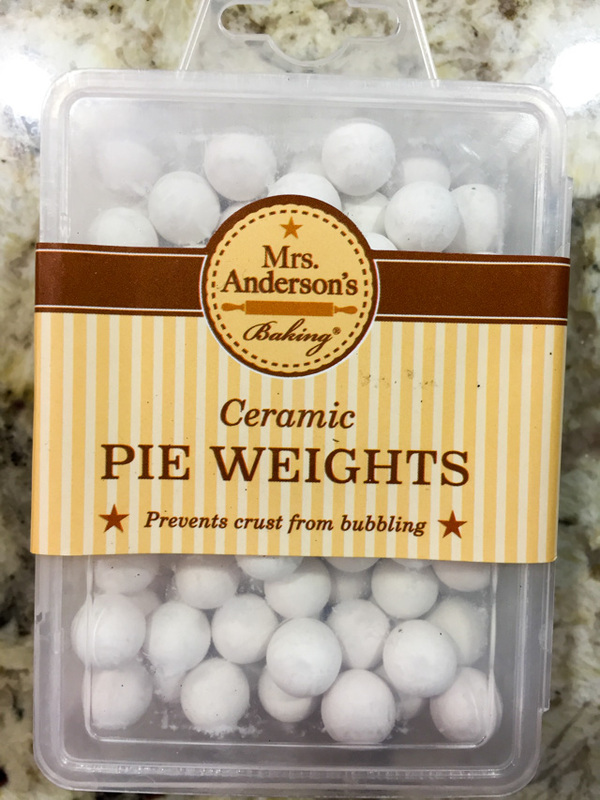 Pie weights = love mine. Nonstick pan = oh goodness, now I “need” another pan. Doggie = adorable as always. To you = Happy new year. xoxo. Happy New Year, Karen… we already celebrated here, but in California you’ve got a little more to wait, so I can wish you once more a wonderful 2016!!!! I always hate to see the end of your posts because they always make me smile or fill me with a bit of good hearted envy and this post is no different. I know when I start seeing the dogs, My fun is nearly over. I have a white pie bird and the same pie weights. I need to point my husband to this post because my 20 year old Cuisinart has already sort-of died. The on-off button no longer works so to make it work I have to flip the power switch at the wall. (our power points have on-off buttons too) I definitely need a new one. I have a Thermomix but I like a food processor I can see what’s going on. Happy New Year Sally! I love these posts and always look forward to seeing the dogs. Sorry Chief isn’t feeling so good. Sadly I lost my dear Spot in Nov ….just getting round to thinking of getting another rescue. 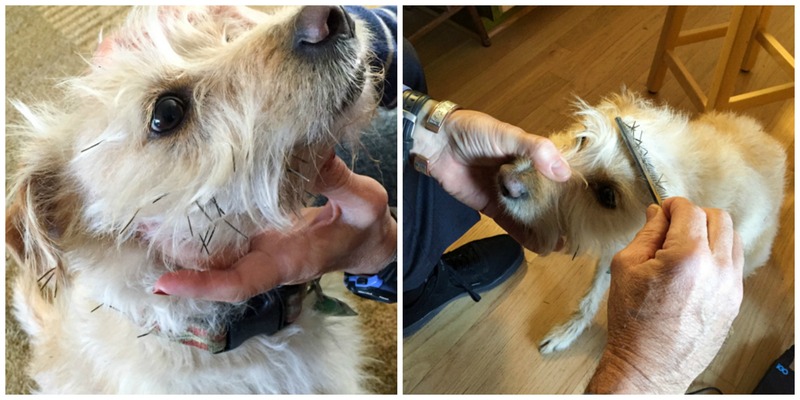 Sorry to hear about Spot…. We thought Chief was not going to make it pass November, but he recovered once again. Tough puppy that one. Headed to his 17th Birthday…. So much to love!! And so many lovely gifts, lucky lady! For me, I love seeing your doggies the most 🙂 they’re so cute!! 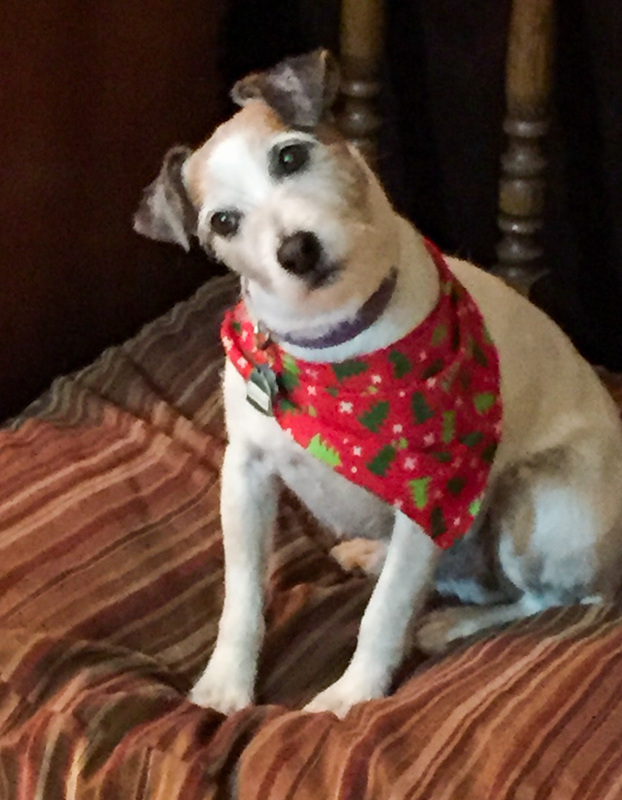 If I include Bob in a post he is always the star…doesn’t matter what i might have cooked!! Happy New Year Sally — I love your new pie bird!! Happy New Year Sally! I love your pretty new pie bird! The happiest, most interesting and productive of New Years . . . may as many matters go ‘your way’ as possible. Fabulous and varied January list: love the unusualness of the letter opener sent by Celia. Naturally and as usual ’tis hard to ‘beat’ the furry family members . . . as long as he is not miserable hope that Chief has a little more time to be with you . . . [and tho’ I don’t usually bake, actually have a piebird in a gleaming white . . .
At the end of my working day have just indulged in 10 luxurious minutes of visiting d’Artagnan – oh, I wish!! What a fabulous artesan choice – I would want to buy half the shop!! And it may be very expensive for the US, but with our specialist prices here the goods seem quite affordable on occasion . . . lucky you, am looking forwards to the post! this post was a really good one! I just ordered my own Hedley & Bennett apron – inspired by your post, I’d been meaning to but couldn’t remember the name – thanks for the link. One of my upcoming projects is duck confit – I’m going to try it poached in olive oil. Best to the furry ones. Good job on all… happy New Year’s. Wonderful kitchen this month! Happy new year. Would love to know the story with the egg. 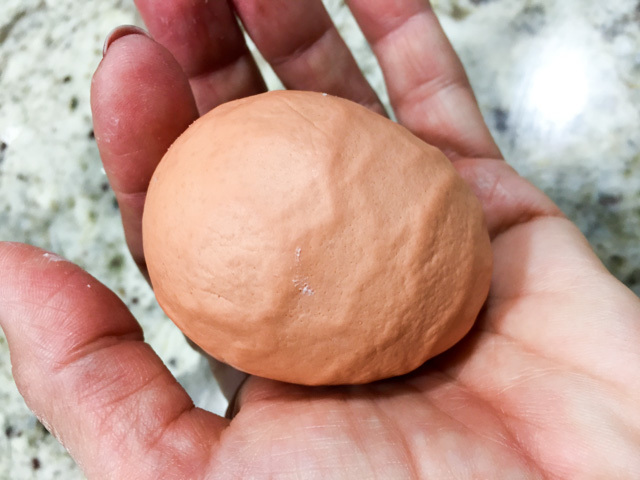 I googled “wrinkled egg shell” and there were lots of theories! 🙂 The egg as a stress ball, now THAT’s a daring gadget! Love it! I think I shall wait a little on the flour and chocolate, but who knows? maybe 2006 is the year of the cake? You’d think? I do enjoy reading these IMK posts, Sally, and it was incredibly kind o you to mention our cookbook in your post. Thank you very much! I, too, have those non-stick pans and they perform every bit as good as was claimed. Happy to hear that Chief has rebounded. 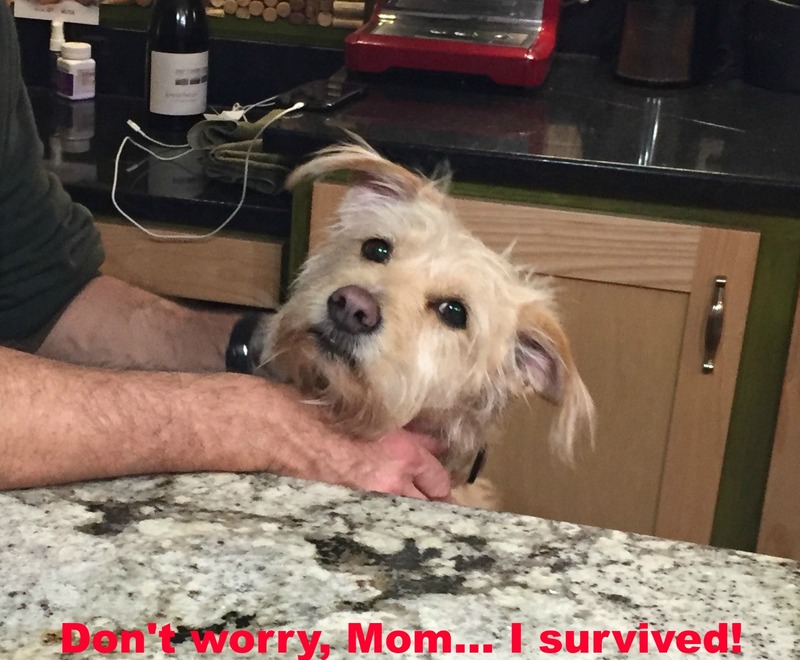 It’s hard to watch one of our four-legged family members not doing well. Max wasn’t well for much of the past week, although he’s all right now. What a relief! Love the apron, too. I’ve thought about getting myself some sort of apron but at this point, with the vast majority of my shirts splattered beyond repair, it would be like closing the barn doors after the horses have run off. I hope that 2016 is filled with peace and joy for you and your loved ones, Sally. So glad to see you here! Have a wonderful 2016, and congrats on getting your book published! Such effort! Oh, it won’t sit in a drawer, no way! But I will break it in gently – cooking stuff that is more manageable… me and cakes? It’s a mess waiting to happen….. Happy New Year. 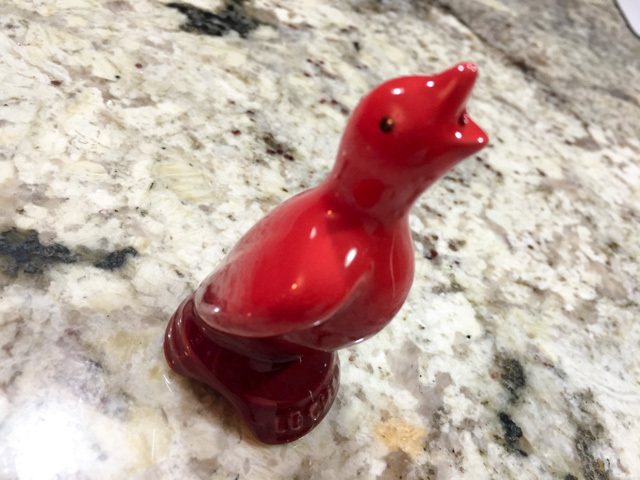 What a lovely array of things in your kitchen, the pie bird is very cute. The apron is a great gift. I wonder why that egg was like that, perhaps from a a sick bird!? I guess it could be a sick bird, poor thing…. amazing that I had never seen or heard about it. Such a lovely snoop round your kitchen and so glad I read all the way to the end for the terriers. Simply gorgeous. Happy New year. The pups will always be there, they get upset if I don’t include them…. 😉 Happy New Year to you too…. and I say thanks for stopping by and saying hello….. Happy New Year to you too…. 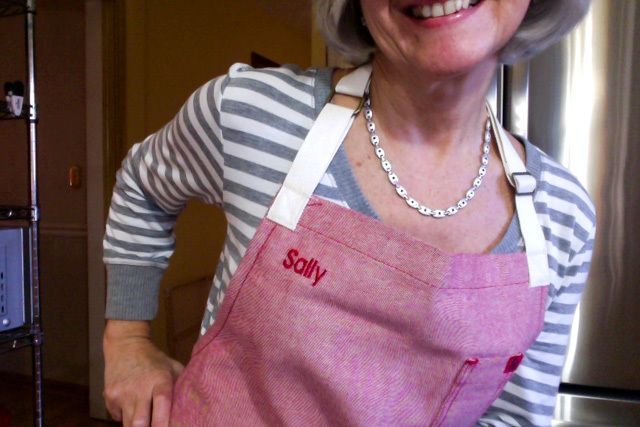 Sally, what a treat to peek into your kitchen… Happy New Year to you, too. From your “bewitching” & beautiful bouquet at the outset, to your beguiling pups at the end (with good friends and good food in between), it looks as though you’ve started the New Year out right! Indeed, all going well with 2016 so far! Great trip to Colorado, skied some, now back to work! Life is good! Happy New Year to you too, thanks for the visit! My pleasure, Sally… no aspirations to take up skiing yet, but if Oklahoma’s recent cold weather keeps up, I might have to. 🙂 Glad you had a good time! perhaps the pie bird is an English thing? they are very common here in australia too. love your red things, and pie weights are used often in my kitchen. so useful.. that is a lovely letter opener that celia has made for you. so pretty. lucky you to get a new processor. i got a new red blender so I can once again make my breakfast smoothies. what gorgeous fur babies you have there.. so cute. Happy 2016! 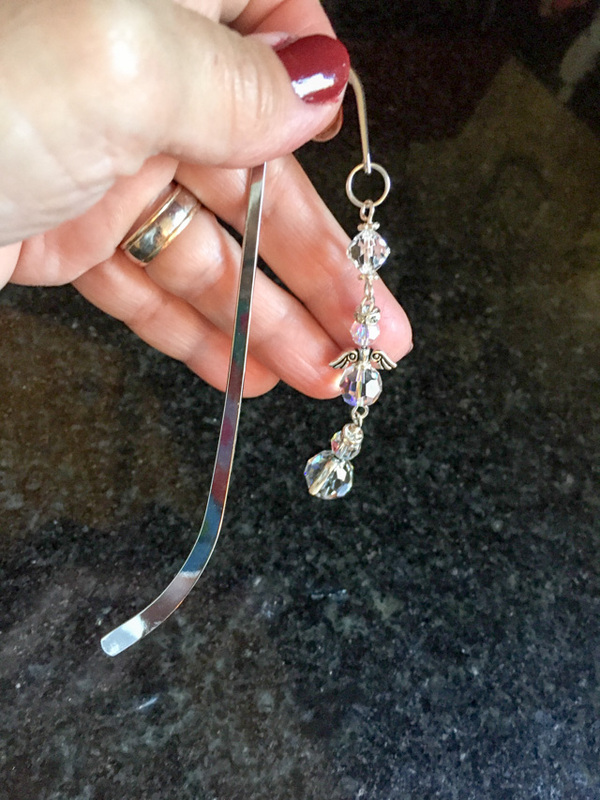 What a special letter opener and love the sparkle it has to brighten everyday life. The pie bird is certainly cute and I could imagine that my children would be fascinated with any pie that would have such a neat thing sitting on top of it. The food processor looks extremely handy!